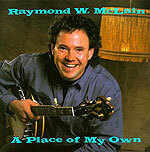 CD review: "A Place of My Own"
A regular on the Grand Ole Opry, Raymond McClain plays some of the meanest banjo you'll ever hear. And while he's still a young man, McClain's new album features some great bluegrass picking more reminiscent of the bands of Lester Flatt or Bill Monroe. Joined throughout by family members from the now-disbanded McClain Family Band, Raymond presents a set of traditional standards and his own compositions which sound as traditional and timeless as the classics.